Bride embroidered bath towel perfect wedding or hen night gift. Bride embroidered bath towel perfect wedding or hen night gift. White cotton bath towel embroidered with the word Bride in your choice of thread colour and letter font style. Please select from the options to personalised this towel in the embroidery style you prefer. Bride embroidered bath towel perfect wedding or hen night gift. 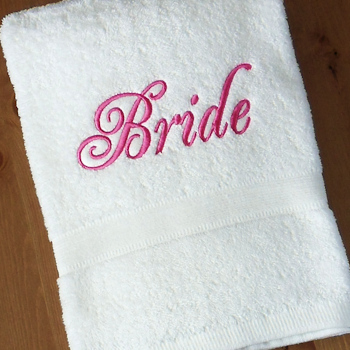 White cotton bath towel embroidered with the word Bride in your choice of thread colour and letter font style. Please select from the options to personalised this towel in the embroidery style you prefer. (Our example picture is sewn in dark pink Elegance font.) Bath towel measures 75 x 125cm and is 500gsm quality.